A little over a decade ago, Jennifer Garner started to make a name for herself as a proficient and convincing action heroine, leaving her mark through both Alias and as the character Elektra in the Daredevil universe. Despite her physicality and fierce dedication to the roles, however, the stories surrounding who she portrayed continuously did a disservice to her ability to command the screen, notably the standalone film for her Marvel character and the stretch of time after her espionage TV series jumped the shark. 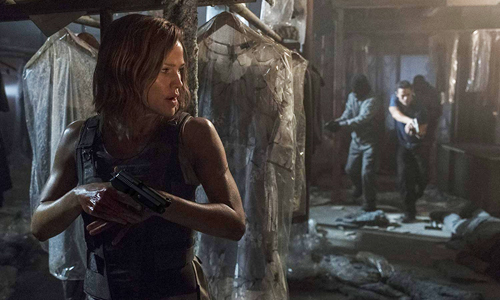 Over a decade later, with very little other action under her belt, Garner has tossed herself into the fray with Peppermint: a revenge-driven thriller with its sights on the intense, somewhat realistic combat that has grown to prominence over the past couple of years. While Garner once again telegraphs a reputable, badass female renegade, the grim and mindless activities fueling her character and the story's developments once again prevent her from spreading her wings. Garner plays Riley North, a mother and banking professional whose family -- a husband and daughter -- sits right on the line of being lower class, forcing her to take extra shifts to help pay the bills. While out later at night due to their scheduling conflicts, Riley and her family are victims of a drive-by shooting, one that leaves only Riley alive. After the law fails to put her family's killers into jail, she disappears without a trace … only to covertly reappear half a decade later as a very different sort of woman. Gradually, gang members and judicial officials start to show up dead, which causes investigative gears to start moving in terms of how they're all connected and who could be doing it. Now a trained fighter and marksman, Riley begins to work her way towards those who were responsible for the deaths of her family members, pitting her against both ruthless gangsters and the pursuit of law enforcement that could halt her vigilantism before she's able to follow it through. There's a large gap of time left mostly unaddressed in Peppermint, the period in which Riley transforms from a noble, durable, but non-combat trained mother to a killing machine who knows the ins-‘n-outs of military grade weaponry, stealth movement, and … well, plenty of comfort in the ways of torture and murder. Leaving how she got to this point open to interpretation may be deliberate, and perhaps injects a little thought-exercise fun into the film for a moment, but it also results in a jarring leap in time to the present and, more importantly, robs Riley North of the opportunity to grow into a compelling, layered outlaw. Did she have certain life experiences in her half-decade of travels that steered her in one philosophical direction or another, and where exactly did she learn everything she knows that transformed her into, for all intents an purposes, an assassin? That's the story I'd like to see about Riley North, and that's what was missing once she begins tearing through her adversaries, in which her rage claims sole responsibility for her motivation and training, leaving it a mystery as to whether -- how -- she had help. 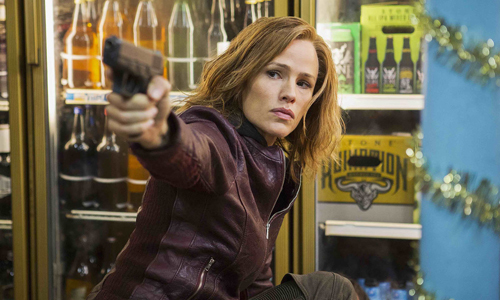 Jennifer Garner channels that rage as best as she can into a defining characteristic for Riley North, powering both the intensity of the action and how she navigates the obstacles in Peppermint. Burdened by all the seriousness of the immensely tragic circumstances, Garner's given very little room to expand upon her character's personality beyond her grief. She does find a distinctive no-holds-barred edge in how she threatens her enemies and draws her weapons, though, elevating the quick and punchy action sequences through gang hideouts and other urban mazes, feeling very much like the craftsmanship of the director of District B-13 and Taken, Pierre Morel. For the most part, gunshots don't go wasted and hand-to-hand struggles aren't drawn out, teetering closer to a semi-pragmatic depiction of a skilled killer in the vein of John Wick. Once Riley steps into the gang's warzone for the first time, it isn't difficult to surrender to the stylized momentum of the action in Peppermint, driven by nifty military-grade weaponry and the kinetic movement of brash cuts and camera jitters in the vein of Tony Scott's later pieces of work. Peppermint doesn't know how to utilize the intensity in intelligent ways, though, and problems created by lapses in critical thinking pile up as Riley gets closer to pulling the trigger on her vengeance, with the hope that its gang-killin', gun-totin' power fantasy will provide enough distractions. From the circumstances of the North's family massacre to how Riley gets deprived of justice and eventually disappears, the script operates on maximum shock-value and minimal real-world credibility, content in assuming that the process of watching this woman -- this mother -- exacting brutal revenge on those who killed her family will keep the film on the rails. However, the more badass Riley North appears as she survives unbelievable odds and complex obstacles, the more one begins to question her background -- again, a civilian bank teller just five years back -- and the competency of her foes. There isn't anything compelling about her targets either, nor about the overbearing corruption of LA's police or judicial system, providing a feeble subplot doubling as tepid commentary on the fallibility of law enforcement. On top of funneling Taken's Mills and Death Wish's Kersey into a female vessel, Peppermint aspires to transform Riley into a Batman-like crime fighter looming in the shadows with assault weapons, and the creation of this superhero mythos falls apart without character-driven puzzle pieces holding it together. Part of how she's built into a folk hero stems from one of the film's few novel ideas, and credit where credit's due: instead of the media learning about the vigilantism and reporting on it after the fact, the story actively incorporates public awareness and perception of Riley North's identity, backstory, and motivations for wiping out the bad guys, tapping into both broadcast news and social media responses. There are good intentions behind how Peppermint plays out that make rooting for Garner's heroine really, really easy to do -- to such a degree that sequels were clearly desired -- but that straightforwardness also contributes to it being weighed down as a dull, dimensionless copy of other vigilante films, and another display of the actress' toughness and tenacity that doesn't quite do her justice.